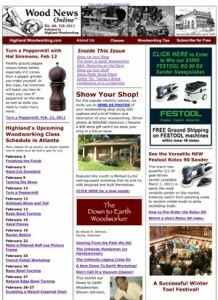 The latest issue of Highland Woodworking’s Wood News Online is available, and packed full of informative tips, stories and of course, great deals. We are kicking off our Festool sweepstakes this month – enter to win over $1000 in Festool products, including the new RO 90 Rotex sander, available for pre-purchase and in stock on March 1st! We’ve also got Michael Curtis’ DREAM shop – you’ll be starting to make plans for your own shop renovation after taking a look at his pictures. Chris Brettnacher’s corner wine rack is featured in this month’s Show Us Your Stuff column. You’ll read a smart safety tip from Bill Peterson, and a great new column from our Down to Earth Woodworker, Steven Johnson – he finally gives us a tour of the Down to Earth Workshop, only to declare that he is building a NEW workshop. It is sure to be another dream workshop we can all appreciate/drool over. All this, and MUCH more, in the latest issue – enjoy!